Richard James Young was born on 2 March 1905. 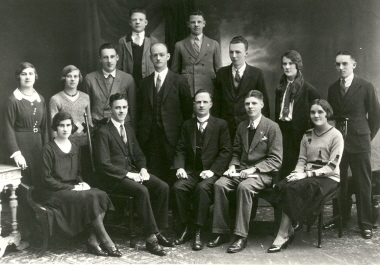 He became an Electrical Engineer, undertaking his training at the Ballarat School of Mines (SMB) between 1921 and 1925. In 1926 SMB conferred on him an Associateship in Electrical Engineering. Richard Young moved to South Australia in c1926 and was employed as an electrical engineer by Broken Hill Associated Smelters at Port Pirrie, retiring from that company on 2 March 1965, aged 60. He died in 1977 at Adelaide. Other members of the Young family attended SMB. Jeffrey was a student in the 1930s, and returned in the 1960s to study painting with Mr Mainwarring. Betty Young studied Dressmaking, and became a pottery assistant to Thomas Tregrove and Neville Bunning. The R.J. Young Scholarship was created during the 1980s in accordance with the will of Richard Young. Students enrolled and who intend undertaking full-time or part-time in either Advanced Certificate, Associate Diploma, Diploma or Advanced Diploma courses at Federation University Australia's SMB Campus are entitled to apply for the annual scholarships. The criteria observed when selecting the scholarship include character, financial circumstances, academic performance, commitment to educational achievement and the objectives of the studies pursued. The first award of the R.J. Young Scholarship was made in 1989. 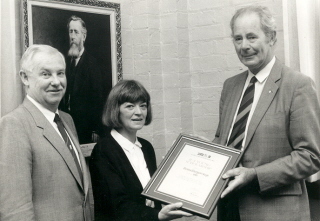 Caption: (Top Right) Presentation of the R.J Young Scholarship to Donna Keys, 1991.